The native form of this personal name is Orbán Viktor Mihály. This article uses Western name order when mentioning individuals. 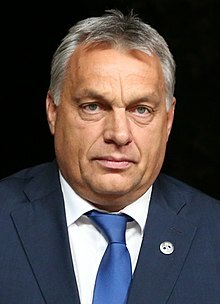 Viktor Mihály Orbán (Hungarian: [ˈviktor ˈorbaːn] ( listen); born 31 May 1963) is a Hungarian politician serving as Prime Minister of Hungary since 2010. He also served as Prime Minister from 1998 to 2002. He is the present leader of the national conservative Fidesz party, a post he has held since 2003 and, previously, from 1993 to 2000. Born in Székesfehérvár, Orbán studied law at Eötvös Loránd University, graduating in 1987. He briefly studied political science at Pembroke College, Oxford, before entering politics in the wake of the Autumn of Nations at the head of the reformist student movement Alliance of Young Democrats (Fiatal Demokraták Szövetsége), the nascent Fidesz. He became a nationally known politician after giving an address at the 1989 reburial of Imre Nagy and other martyrs of the 1956 revolution, in which he openly demanded that Soviet troops withdraw from the country. After the transition to democracy in 1990, he was elected to the National Assembly and served as leader of Fidesz's parliamentary caucus until 1993. Under his leadership, Fidesz shifted away from its original centre-right, classical liberal, pro-European integration platform toward right-wing national conservatism. After Fidesz won a plurality of seats in the National Assembly in the 1998 elections, Orbán became Prime Minister for four years at the head of a right-wing coalition government. Fidesz narrowly lost the 2002 and 2006 elections to the Socialist Party, and Orbán spent eight years as the leader of the opposition. The Socialists' rising unpopularity, exacerbated by Prime Minister Ferenc Gyurcsány's "Őszöd speech", led to Orbán's re-election to the premiership in 2010 in a landslide victory (in coalition with the Christian Democrats). At the helm of a parliamentary supermajority, Orbán's cabinet spearheaded major constitutional and legislative reforms. Fidesz retained its supermajority in the 2014 and 2018 elections. Orbán's social conservatism, national conservatism, soft Euroscepticism and advocacy of what he describes as an "illiberal state" have attracted significant international attention. Some observers have described his government as authoritarian or autocratic. In August 2018, Orbán became the second longest-serving Prime Minister after Kálmán Tisza. If his current government lasts a full term, upon its completion, he will become the longest-serving Hungarian Prime Minister in history. Orbán was born on 31 May 1963 in Székesfehérvár into a rural middle-class family, as the eldest son of the entrepreneur and agronomist Győző Orbán (born 1940) and the special educator and speech therapist, Erzsébet Sípos (born 1944). He has two younger brothers, both entrepreneurs, Győző, Jr. (born 1965) and Áron (born 1977). His paternal grandfather, Mihály Orbán, practiced farming and animal husbandry. Orbán spent his childhood in two nearby villages, Alcsútdoboz and Felcsút in Fejér County; he attended school there and in Vértesacsa. In 1977, his family moved permanently to Székesfehérvár. Orbán graduated from Blanka Teleki High School in Székesfehérvár in 1981, where he studied English. After completing two years of military service, he studied law at Eötvös Loránd University in Budapest, writing his master's thesis on the Polish Solidarity movement. After graduation in 1987, he lived in Szolnok for two years, commuting to his job in Budapest as a sociologist at the Management Training Institute of the Ministry of Agriculture and Food. In 1989, Orbán received a scholarship from the Soros Foundation to study political science at Pembroke College, Oxford. His personal tutor was the Hegelian political philosopher Zbigniew Pełczyński. In January 1990, he left Oxford and returned to Hungary to run for a seat in Hungary's first post-communist parliament. At the age of 14 and 15, he was a secretary of the communist youth organisation, KISZ, of his secondary grammar school (KISZ membership was mandatory for university admittance). Orbán said in a later interview that his political views had radically changed during the military service: earlier he had considered himself a "naive and devoted supporter" of the Communist regime. On 30 March 1988, Orbán was one of the founding members of Fidesz (originally an acronym for Fiatal Demokraták Szövetsége, "Alliance of Young Democrats") and served as its first spokesperson. The first members of the party, including Orbán, were mostly students from the Bibó István College for Advanced Studies who opposed the Communist regime. At the college, Orbán edited the social science journal Századvég ("End of Century") and was one of the key figures among the radical students. On 16 June 1989, Orbán gave a speech in Heroes' Square, Budapest, on the occasion of the reburial of Imre Nagy and other national martyrs of the 1956 Hungarian Revolution. In his speech, he demanded free elections and the withdrawal of Soviet troops. The speech brought him wide national and political acclaim. 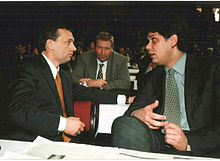 In summer 1989, he took part in the opposition round table talks, representing Fidesz alongside László Kövér. On returning home from Oxford, he was elected Member of Parliament from his party's Pest County Regional List during the 1990 parliamentary election. He was appointed leader of the Fidesz's parliamentary group, serving in this capacity until May 1993. On 18 April 1993, Orbán became the first president of Fidesz, replacing the national board that had served as a collective leadership since its founding. Under his leadership, Fidesz gradually transformed from a radical liberal student organization to a center-right people's party. The conservative turn caused a severe split in the membership. Several members left the party, including Péter Molnár, Gábor Fodor and Zsuzsanna Szelényi. Fodor and others later joined the liberal Alliance of Free Democrats (SZDSZ), initially a strong ally of Fidesz, but later a political opponent. During the 1994 parliamentary election, Fidesz barely reached the 5% threshold. Orbán became MP from his party's Fejér County Regional List. He served as chairman of the Committee on European Integration Affairs between 1994 and 1998. He was also a member of the Immunity, Incompatibility and Credentials Committee for a short time in 1995. Under his presidency, Fidesz adopted "Hungarian Civic Party" (Magyar Polgári Párt) to its shortened name in 1995. His party gradually became dominant in the right-wing of the political spectrum, while the former ruling conservative Hungarian Democratic Forum (MDF) had lost much of its support. From April 1996, Orbán was chairman of the Hungarian National Committee of the New Atlantic Initiative (NAI). In September 1992, Orbán was elected vice chairman of the Liberal International. In November 2000, however, Fidesz left the Liberal International and joined the European People's Party. During the time, Orbán worked hard to unite the center-right liberal conservative parties in Hungary. At the EPP's Congress in Estoril in October 2002, he was elected vice-president, an office he held until 2012. 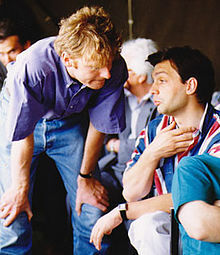 In 1998, Orbán formed a successful coalition with the Hungarian Democratic Forum (MDF) and the Independent Smallholders' Party (FKGP) and won the 1998 parliamentary elections with 42% of the national vote. 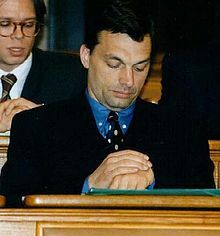 Orbán became the second youngest Prime Minister of Hungary at the age of 35 (after András Hegedüs), serving between 1998 and 2002. The new government immediately launched a radical reform of state administration, reorganizing ministries and creating a superministry for the economy. In addition, the boards of the social security funds and centralized social security payments were dismissed. Following the German model, Orbán strengthened the Prime Minister's office and named a new minister to oversee the work of his Cabinet. In the process, thousands of civil servants were replaced (no distinction is made between political and civil servant posts, resulting in a strong "winner takes all" practice). The overall direction was towards centralized control. Despite vigorous protests from the opposition parties, in February the government decided that plenary sessions of the unicameral National Assembly would be held only every third week. As a result, according to opposition arguments, parliament's legislative efficiency and ability to supervise the government were reduced. In late March, the government tried to replace the National Assembly rule that requires a two-thirds majority vote with one of a simple majority, but the Constitutional Court ruled this unconstitutional. The year saw only minor changes in top government officials. Two of Orbán's state secretaries in the Prime Minister's office had to resign in May, due to their implication in a bribery scandal involving the American military manufacturer Lockheed Martin Corporation. Before bids on a major jet-fighter contract, the two secretaries, along with 32 other deputies of Orbán's party, had sent a letter to two US senators to lobby for the appointment of a Budapest-based Lockheed manager to be the US ambassador to Hungary. On 31 August, the head of the Tax Office also resigned, succumbing to protracted attacks by the opposition on his earlier, allegedly suspicious, business dealings. The tug-of-war between the Budapest City Council and the government continued over the government's decision in late 1998 to cancel two major urban projects: the construction of a new national theatre and of the fourth subway line. Relations between the Fidesz-led coalition government and the opposition worsened in the National Assembly, where the two seemed to have abandoned all attempts at consensus-seeking politics. The government pushed to swiftly replace the heads of key institutions (such as the Hungarian National Bank chairman, the Budapest City Chief Prosecutor and the Hungarian Radio) with partisan figures. Although the opposition resisted, for example by delaying their appointing of members of the supervising boards, the government ran the institutions without the stipulated number of directors. In a similar vein, Orbán failed to show up for question time in parliament, for periods of up to 10 months. His statements of the kind that "The parliament works without opposition too..." also contributed to the image of an arrogant and aggressive governance. A later report in March by the Brussels-based International Federation of Journalists criticized the Hungarian government for improper political influence in the media, as the country's public service broadcaster teetered close to bankruptcy. Numerous political scandals during 2001 led to a de facto, if not actual, breakup of the coalition that held power in Budapest. A bribery scandal in February triggered a wave of allegations and several prosecutions against the Independent Smallholders' Party. The affair resulted in the ousting of József Torgyán from both the FKGP presidency and the top post in the Ministry of Agriculture. The FKGP disintegrated and more than a dozen of its MPs joined the government faction. Orbán's economic policy was aimed at cutting taxes and social insurance contributions over four years, while reducing inflation and unemployment. Among the new government's first measures was to abolish university tuition fees and reintroduce universal maternity benefits. The government announced its intention to continue the Socialist–Liberal stabilization program and pledged to narrow the budget deficit, which had grown to 4.5% of GDP. The previous Cabinet had almost completed the privatization of government-run industries and had launched a comprehensive pension reform. However, the Socialists had avoided two major socioeconomic issues—reform of health care and agriculture, these remained to be tackled by Orbán's government. Economic successes included a drop in inflation from 15% in 1998 to 10.0% in 1999, 9.8% in 2000 and 7.8% in 2001. GDP growth rates were fairly steady: 4.4% in 1999, 5.2% in 2000, and 3.8% in 2001. The fiscal deficit fell from 3.9% in 1999, to 3.5% in 2000 and 3.4% in 2001 and the ratio of the national debt decreased to 54% of GDP. Under the Orbán cabinet, there were realistic hopes that Hungary would be able to join the Eurozone by 2009. However, negotiations for entry into the European Union slowed in the fall of 1999, after the EU included six more countries (in addition to the original six) in the accession discussions. Orbán repeatedly criticized the EU for its delay. Orbán also came under criticism for pushing through an unprecedented two-year budget and for failing to curb inflation, which only dropped a half point, from 10% in 1999 to 9.5% in 2000, despite the tight monetary policy of the Central Bank. However, investments continued to grow. In March 1999, after Russian objections were overruled, Hungary joined NATO along with the Czech Republic and Poland. The Hungarian membership to NATO demanded its involvement in Federal Republic of Yugoslavia's Kosovo crisis and modernization of its army. NATO membership also gave a blow to the economy because of a trade embargo imposed on Yugoslavia. Hungary attracted international media attention in 1999 for passing the "status law" concerning estimated three-million ethnic Hungarian minorities in neighbouring Romania, Slovakia, Serbia and Montenegro, Croatia, Slovenia and Ukraine. The law aimed to provide education, health benefits and employment rights to those, and was said to heal the negative effects of the disastrous 1920 Trianon Treaty. Governments in neighbouring states, particularly Romania, claimed to be insulted by the law, which they saw as an interference in their domestic affairs. The proponents of the status law countered that several of the countries criticizing the law themselves have similar constructs to provide benefits for their own minorities. Romania acquiesced after amendments following a December 2001 agreement between Orbán and Romanian Prime Minister Adrian Năstase; Slovakia accepted the law after further concessions made by the new government after the 2002 elections. The level of public support for political parties generally stagnated, even with general elections coming in 2002. Fidesz and the main opposition Hungarian Socialist Party (MSZP) ran neck and neck in the opinion polls for most of the year, both attracting about 26% of the electorate. According to a September 2001 poll by the Gallup organization, however, support for a joint Fidesz – Hungarian Democratic Forum party list would run up to 33% of the voters, with the Socialists drawing 28% and other opposition parties 3% each. Meanwhile, public support for the FKGP plunged from 14% in 1998 to 1% in 2001. As many as 40% of the voters remained undecided, however. Although the Socialists had picked their candidate for Prime Minister—former finance minister Péter Medgyessy—the opposition largely remained unable to increase its political support. The dark horse of the election was the radical nationalist Hungarian Justice and Life Party (MIÉP), with its leader, István Csurka's radical rhetoric. MIÉP could not be ruled out as the key to a new term for Orbán and his party, should they be forced into a coalition after the 2002 elections. The elections of 2002 were the most heated Hungary had experienced in more than a decade, and an unprecedented cultural-political division formed in the country. In the event, Viktor Orbán's group lost the April parliamentary elections to the opposition Hungarian Socialist Party, which set up a coalition with its longtime ally, the liberal Alliance of Free Democrats. Turnout was a record-high 73.5%. Beyond these parties, only deputies of the Hungarian Democratic Forum made it into the National Assembly. The populist Independent Smallholders' Party and the right Hungarian Justice and Life Party lost all their seats. Thus, the number of political parties in the new assembly was reduced from six to four. MIÉP challenged the government's legitimacy, demanded a recount, complained of election fraud, and generally kept the country in election mode until the October municipal elections. The socialist-controlled Central Elections Committee ruled that a recount was unnecessary, a position supported by observers from the Organization for Security and Co-operation in Europe, whose only substantive criticism of the election conduct was that the state television carried a consistent bias in favour of Fidesz. Orbán received the Freedom Award of the American Enterprise Institute and the New Atlantic Initiative (2001), the Polak Award (2001), the Grand Cross of the National Order of Merit (2001), the "Förderpreis Soziale Marktwirtschaft" (Price for the Social Market Economy, 2002) and the Mérite Européen prize (2004). In April 2004, he received the Papal Grand Cross of the Order of St. Gregory the Great. In the 2004 European Parliament election, the ruling Hungarian Socialist Party was heavily defeated by the opposition conservative Fidesz. Fidesz gained 47.4% of the vote and 12 of Hungary's 24 seats. Orbán was the Fidesz candidate for the parliamentary election in 2006. Fidesz and its new-old candidate failed again to gain a majority in this election, which initially put Orbán's future political career as the leader of Fidesz in question. However, after fighting with Socialist-Liberal coalition, Orbán's position solidified again, and he was elected president of Fidesz yet again for another term in May 2007. 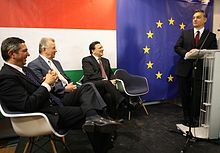 On 17 September 2006, an audio recording surfaced from a closed-door Hungarian Socialist Party meeting, which was held on 26 May 2006, in which Hungarian Prime Minister Ferenc Gyurcsány made a speech, notable for its obscene language. On 1 November, Orbán and his party announced their plans to stage several large-scale demonstrations across Hungary on the anniversary of the Soviet suppression of the 1956 Revolution. The events were intended to serve as a memorial to the victims of the Soviet invasion and a protest against police brutality during the 23 October unrest in Budapest. Planned events included a candlelight vigil march across Budapest. However, the demonstrations were small and petered out by the end of the year. A new round of demonstrations expected in the spring of 2007 did not materialize. On 1 October 2006, Fidesz won the municipal elections, which counterbalanced the MSZP-led government's power to some extent. Fidesz won 15 of 23 mayoralties in Hungary's largest cities—although it narrowly lost Budapest to the Liberal Party—and majorities in 18 of 20 regional assemblies. On 9 March 2008, a national referendum took place on revoking government reforms which introduced doctor fees per visit and medical fees paid per number of days spent in hospital as well, as tuition fees in higher education. Hungarians usually call this popular vote the social referendum. The referendum was initiated by opposition party Fidesz against the ruling MSZP. The procedure for the referendum started on 23 October 2006, when Orbán announced they would hand in seven questions to the National Electorate Office, three of which (on abolishing copayments, daily fees and college tuition fees) were officially approved on 17 December 2007 and called on 24 January 2008. It was assumed likely that the referendum will pass, but it was uncertain whether turnout would be high enough to make it valid; polls indicated about 40% turnout with 80% in favour of rescinding the three reforms. In the 2009 European Parliament election, Fidesz won by a large margin, garnering 56.36% of votes and 14 of Hungary's 22 seats. During the 2010 parliamentary elections, Orbán's party won 52.73% of the popular vote, with a two-thirds majority of seats, which gave Orbán enough authority to change the Constitution. As a result, Orbán's government added an article in support of traditional marriage in the constitution, and a controversial electoral reform, which lowered the number of seats in the Parliament of Hungary from 386 to 199. In his second term as Prime Minister, he garnered controversy for his statements against liberal democracy, for proposing an "internet tax", and for his perceived corruption. His second premiership has seen numerous protests against his government, including one in Budapest in November 2014 against the proposed "internet tax". In terms of domestic legislation, Orbán's government implemented a flat tax on personal income. This tax is set at 16%. Orbán has called his government "pragmatic", citing restrictions on early retirement in the police force and military, making welfare more transparent, and a central banking law that "gives Hungary more independence from the European Central Bank". After the 2014 parliamentary election, Fidesz won a majority, garnering 133 of the 199 seats in the National Assembly. While he won a large majority, he garnered 44.54% of the national vote, down from 52.73% in 2010. During the 2015 European migrant crisis, Orbán ordered the erection of the Hungary–Serbia barrier to block entry of illegal immigrants so that Hungary could register all the migrants arriving from Serbia, which is the country's responsibility under the Dublin Regulation, a European Union law. Under Orbán, Hungary took numerous actions to combat illegal immigration and reduce refugee levels. Orbán questioned Nord Stream II, a new Russia–Germany natural gas pipeline. He said he wants to hear a "reasonable argument why South Stream was bad and Nord Stream is not". "South Stream" refers to the Balkan pipeline cancelled by Russia in December 2014 after obstacles from the EU. Since 2017, Hungary's relations with Ukraine rapidly deteriorated over the issue of the Hungarian minority in Ukraine. Orbán and his cabinet ministers repeatedly criticized Ukraine's 2017 education law, which makes Ukrainian the only language of education in state schools, and threatened to block further Ukraine's EU and NATO integration until it is modified or repealed. Orbán's blend of soft Euroscepticism, populism, and national conservatism has seen him compared to politicians and political parties as diverse as Jarosław Kaczyński's Law and Justice, Silvio Berlusconi's Forza Italia, Marine Le Pen's Front National, Donald Trump, Recep Tayyip Erdoğan and Vladimir Putin. According to Politico, Orbán political philosophy "echoes the resentments of what were once the peasant and working classes" by promoting an "uncompromising defense of national sovereignty and a transparent distrust of Europe's ruling establishments". Orbán has a close relationship to Israeli Prime Minister Benjamin Netanyahu, having known him for decades. He is described as "one of Mr Netanyahu's closest allies in Europe." Orban received personal advice on economic reforms from Netanyahu, while the latter was Finance Minister of Israel (2003–2005). Orbán is seen as having laid out his political views most concretely in a widely cited 2014 public address at Băile Tușnad (known in Hungary as the Tusnádfürdői beszéd, or "Tusnádfürdő speech"). In the address, Orbán repudiated the classical liberal theory of the state as a free association of atomistic individuals, arguing for the use of the state as the means of organizing, invigorating, or even constructing the national community. Although this kind of state respects traditionally liberal concepts like civic rights, it is properly called "illiberal" because it views the community, and not the individual, as the basic political unit. In practice, Orbán claimed, such a state should promote national self-sufficiency, national sovereignty, familialism, full employment and the preservation of cultural heritage, and cited countries such as Turkey, India, Singapore, Russia, and China as models. Orbán's second and third premierships have been the subject of significant international controversy, and reception of his political views is mixed. The 2011 constitutional changes enacted under his leadership were, in particular, accused of centralizing legislative and executive power, curbing civil liberties, restricting freedom of speech, and weakening the Constitutional Court and judiciary. For these reasons, critics have described him as "irredentist", "right-wing populist", "authoritarian", "autocratic", "Putinist", as a "strongman", and as a "dictator". Other commentators, however, noted that the European migrant crisis, coupled with continued Islamist terrorism in the European Union, have popularized Orbán's nationalist, protectionist policies among European conservative leaders. "Once ostracized" by Europe's political elite, writes Politico, Orbán "is now the talisman of Europe's mainstream right". As other Visegrád Group leaders, Orbán opposes any compulsory EU long-term quota on redistribution of migrants. He wrote in the Frankfurter Allgemeine Zeitung: "Europe's response is madness. We must acknowledge that the European Union's misguided immigration policy is responsible for this situation". He also demanded an official EU list of "safe countries" to which migrants can be returned. According to Orbán, Turkey should be considered a safe third country. Orbán has promoted The Great Replacement conspiracy theory. Le Journal du Dimanche reported on Orbán's explicit adoption of the conspiracy theory, after he claimed; "if we let tens of millions of migrants travel to Europe from Africa and the Middle East... the young people of Western Europe will know the day when they will be in a minority in their own country". Orbán's critics have included domestic and foreign leaders (including former United States Secretary of State Hillary Clinton, German Chancellor Angela Merkel, and the Presidents of the European Commission José Manuel Barroso, and Jean-Claude Juncker), intergovernmental organisations, non-governmental organisations. Specifically, he has been accused of pursuing anti-democratic reforms; reducing the independence of Hungary's press, judiciary and central bank; amending Hungary's constitution to prevent amendments to Fidesz-backed legislation; and of cronyism and nepotism. He was accused of pork barrel politics for building a 4,000-seat stadium in the village in which he grew up, Felcsút, at a distance of some 20 ft from his country house. Some opposition parties and critics also consider Orbán an opponent of European integration. In 2000, opposition parties MSZP and SZDSZ and the left-wing press presented Orbán's comment that "there's life outside the EU" as proof of his anti-Europeanism and sympathies with the radical right. In the same press conference, Orbán clarified that "[w]e're trying to make the accession fast because it may boost the growth of Hungary's economy". Hungarian-American business magnate and political activist George Soros criticized Orbán's handling of the European migrant crisis in 2015, saying: "His plan treats the protection of national borders as the objective and the refugees as an obstacle. Our plan treats the protection of refugees as the objective and national borders as the obstacle." The Orbán government began to attack Soros and his NGOs since early 2017, particularly for his support for more open immigration. In July 2017, the Israeli ambassador in Hungary joined Jewish groups and others in denouncing a billboard campaign backed by the government. Orbán's critics claimed it "evokes memories of the Nazi posters during the Second World War". The ambassador stated that the campaign "evokes sad memories but also sows hatred and fear", an apparent reference to the Holocaust. Hours later, Israel's Ministry of Foreign Affairs issued a "clarification", denouncing Soros, stating that he "continuously undermines Israel's democratically elected governments" and funded organizations "that defame the Jewish state and seek to deny it the right to defend itself". The clarification came a few days before an official visit to Hungary by Israeli Prime Minister Benjamin Netanyahu. The anti-Soros messages became key elements of the government's communication and campaign since then, which, among others, also targeted the Central European University (CEU). Orbán married jurist Anikó Lévai in 1986; the couple have five children. Their eldest daughter, Ráhel, is married to entrepeneur István Tiborcz, whose company, Elios was accused of receiving unfair advantages when winning public tenders. Orbán's son, Gáspár, is a retired footballer, who played for Ferenc Puskás Football Academy in 2014. He is also the founder of a religious community called Felház. Orbán has three younger daughters (Sára, Róza, Flóra) and three granddaughters (Ráhel's children Aliz and Anna Adél; Sára's daughter Johanna). Orbán is a member of the Calvinist Hungarian Reformed Church, while his wife and their five children are Roman Catholic. He is very fond of sports, especially of football; he was a signed player of the Felcsút football team, and as a result he also appears in Football Manager 2006. Orbán has played football from his early childhood. He was a professional player with FC Felcsút. After ending his football career, he became one of the main financiers of the Hungarian football and his hometown's club, Felcsút FC, later renamed the Ferenc Puskás Football Academy. He had a prominent role in the foundation of Puskás Akadémia in Felcsút, creating one of the most modern training facilities for young Hungarian footballers. He played an important role in establishing the annually organised international youth cup, the Puskás Cup, at Pancho Aréna, which he also helped build, in his hometown of Felcsút. His only son, Gáspár, learned and trained there. Then FIFA president Sepp Blatter visited the facilities at the Puskás Academy in 2009. Blatter, together with the widow of Ferenc Puskás, as well as Orbán, founder of the Academy, announced the creation of the new FIFA Puskás Award during that visit. He played the bit part of a footballer in the Hungarian family film Szegény Dzsoni és Árnika (1983). Egy az ország. Helikon Könyvkiadó, Budapest, 2007. (translated into Polish as Ojczyzna jest jedna in 2009). Rengéshullámok. Helikon Könyvkiadó, Budapest, 2010. ^ Orbánnak kiütötték az első két fogát, Origo, 20 December 2012; accessed 30 August 2012. ^ "Prime Minister Viktor Orbán's speech at the 25th Bálványos Summer Free University and Student Camp". 30 July 2014. And so in this sense the new state that we are constructing in Hungary is an illiberal state, a non-liberal state. It does not reject the fundamental principles of liberalism such as freedom, and I could list a few more, but it does not make this ideology the central element of state organisation, but instead includes a different, special, national approach. ^ Meijers, Maurits; van der Veer, Harmen. "Hungary's government is increasingly autocratic. What is the European Parliament doing about it?". The Washington Post. Retrieved 17 December 2017. ^ "What to do when Viktor Orban erodes democracy". The Economist. Retrieved 17 December 2017. ^ Kingsley, Patrick (10 February 2018). "As West Fears the Rise of Autocrats, Hungary Shows What's Possible". The New York Times. ISSN 0362-4331. Retrieved 10 February 2018. ^ Kelemen, R. Daniel (2017). "Europe's Other Democratic Deficit: National Authoritarianism in Europe's Democratic Union". Government and Opposition. 52 (2): 211–238. doi:10.1017/gov.2016.41. ISSN 0017-257X. ^ A Közgép is hizlalhatja Orbán Győző cégét, Heti Világgazdaság, 11 July 2012. ^ "Erzsébet Sípos". Geni.com. Retrieved 19 March 2019. ^ Paul Lendvai 2017, p. 11–12. ^ Pünkösti, Árpád (13 May 2000). "Szeplőtelen fogantatás 7". Népszabadság (in Hungarian). Retrieved 19 March 2019. ^ Paul Lendvai 2017, pp. 14, 265. ^ Kenney, Padraic (2002). A Carnival of Revolution: Central Europe 1989. Princeton: Princeton University Press. p. 138. ISBN 0-691-05028-7. ^ Paul Lendvai 2017, p. 23. ^ Pünkösti Árpád: Szeplőtelen fogantatás. Népszabadság Könyvek, Budapest, 2005, pp 138–139. 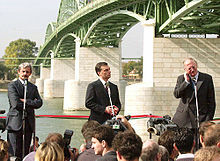 ^ Debreczeni, József: Orbán Viktor, Osiris Kiadó, Budapest, 2002. ^ Paul Lendvai 2017, p. 21. ^ Paul Lendvai 2017, p. 17–21. ^ Martens 2009, pp. 192–93. ^ , Hungary under Orbán: Can Central Planning Revive Its Economy?, Simeon Djankov, Peterson Institute for International Economics, July 2015; accessed 20 January 2015. ^ Petőcz, György: Csak a narancs volt. Irodalom Kft, 2001 ISBN 963-00-8876-2. ^ Paul Lendvai 2017, p. 26. ^ a b Martens 2009, p. 193. ^ Kormányfői múltidézés: a jogászok a nyerők, Zona.hu. ^ Stumpf lesz a miniszterelnök-helyettes, Origo, 21 November 2001; accessed 15 March 2014. ^ A parlamenti pártokat még mindig megosztja a háromhetes ülésezés. Népszava, 3 March 2000. ^ Bírálják az új munkarendet. A háromhetes ciklus miatt összeomolhat a törvénygyártás gépezete. Népszava, 4 March 1999. ^ Lajos Bodnár: Marad a háromhetes munkarend. Az ellenzéknek az őszi parlamenti ülésszak idején sem lesz ereje a változtatáshoz. Magyar Hírlap, 23 July 2001. ^ István Kukorelli – Péter Smuk: A Magyar Országgyűlés 1990–2010. Országgyűlés Hivatala, Budapest, 2011. pp. 47–48. ^ Tamás Bauer: A parlament megcsonkítása. Népszava, 8 February 1999. ^ 4/1999. (III. 31.) AB határozat, Magyar Közlöny: 1999. évi 27. szám and AB közlöny: VIII. évf. 3. szám. ^ Orbán nem gyanít korrupciót a Lockheed-botrány mögött, Origo, 26 May 1999; accessed 24 July 2012. ^ Történeti áttekintés Archived 13 September 2015 at the Wayback Machine, National Theatre; accessed 17 June 2018. (in Hungarian). ^ Népszabadság Archívum, Népszabadság; accessed 15 March 2014. ^ Nemzetközi Újságíró-szövetség vizsgálná a magyar médiát, Index, 13 January 2001; accessed 15 March 2014. ^ Torgyán lemondott, Index, 8 February 2001; accessed 15 March 2014. ^ a b Gazdag, László: Így kormányozták a magyar gazdaságot, FN.hu, 12 February 2012; accessed 15 March 2014. ^ Kétéves költségvetés készül a PM-ben, Origo, 31 July 2001; accessed 15 March 2014. ^ Magyarország teljes jogú NATO-tag, Origo, 12 March 1999; accessed 15 March 2014. ^ Bell 2003, p. 315. 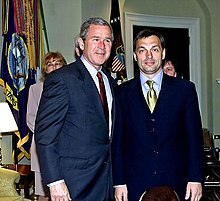 ^ Nastase-Orbán egyezség készül a státustörvényről, Transindex, 17 December 2001; accessed 15 March 2014. ^ A magyar státustörvény fogadtatása és alkalmazása a Szlovák Köztársaságban, Center for Legal Analyses-Kalligram Foundation; accessed 15 March 2014. ^ Gallup: nőtt a Fidesz-MDF közös lista előnye, Origo, 15 November 2001; accessed 15 March 2014. ^ A MIÉP cselekvésre szólít a 'csalás' miatt, Index, 22 April 2002; accessed 15 March 2014. ^ Hack, Péter (18 June 2004). "A vereség tanulságai". Hetek (in Hungarian). Retrieved 19 March 2019. ^ "A Fidesz győzött, és a legnagyobb európai frakció tagja lesz". 24.hu (in Hungarian). 14 June 2004. Retrieved 19 March 2019. ^ Ismét Orbán Viktor lett a Fidesz elnöke Archived 25 March 2012 at the Wayback Machine Politaktika.hu; accessed 12 April 2018. ^ Gorondi, Pablo (27 February 2007) "Hungary's prime minister expects political tension but no riots on 15 March commemorations", Associated Press. ^ "Vokscentrum – a választások univerzuma". Vokscentrum.hu. 2006. Archived from the original on 18 August 2007. Retrieved 17 April 2010. ^ "Opposition makes substantial gains in Hungarian elections". Taipei Times. 3 October 2006. Retrieved 11 May 2017. ^ "Hungarian president announces referendum date", Xinhua (People's Daily), 24 January 2008. ^ "Hungary's ruling MSZP vows to stick to medical reforms despite referendum – People's Daily Online". People's Daily. Retrieved 12 April 2018. ^ "EP-választás: A jobboldal diadalmenete". EURACTIV. 8 June 2009. Archived from the original on 26 September 2011. Retrieved 8 June 2011. ^ "Q&A Hungary's controversial constitutional changes". BBC News. ^ "Viktor Orban steers Hungary towards Russia". The New York Times. ^ "Opposing Orban". The Economist. ^ Eder, Marton. "Hungary's personal income tax still under fire. The Wall Street Journal. June 2012. ^ "Profile: Hungary's Prime Minister". BBC News. ^ "Hungary election". BBC News. ^ Troianovski, Anton (19 August 2015). "Migration crisis pits EU's East against West". The Wall Street Journal. Retrieved 19 August 2015. ^ Savitsky, Shane (1 February 2017). "Border fences and refugee bans: Hungary did it — fast". Axios. Retrieved 3 December 2017. ^ "Germany's Merkel defends Russian gas pipeline plan". The Wall Street Journal. 18 December 2015. ^ Szpala, Marta; Gniazdowski, Mateusz; Groszkowski, Jakub; Łoskot-Strachota, Agata; Sadecki, Andrzej (17 December 2014). "Central and South-Eastern Europe after the cancellation of South Stream". Centre for Eastern Studies. Retrieved 19 March 2019. ^ "Ukraine defends education reform as Hungary promises 'pain'". The Irish Times. 27 September 2017. ^ "Hungary–Ukraine relations hit new low over troop deployment". New Europe. 26 March 2018. ^ "Ukrainian language bill facing barrage of criticism from minorities, foreign capitals". Radio Free Europe/Radio Liberty. 24 September 2017. ^ "Criticism of Ukraine's language law justified: rights body". Reuters. 8 December 2017. ^ "Hungary: One-party rule". The Guardian (editorial). London. 5 January 2011. ^ Castle, Stephen (22 April 2002). "Populist premier set for defeat in Hungarian election". The Independent. London. ^ a b c Waller, Luke. "Viktor Orbán: The conservative subversive". Politico. Retrieved 9 May 2016. ^ Simonyi, Andras (12 October 2014). "Putin, Erdogan and Orban: Band of Brothers?". The Huffington Post. Retrieved 9 May 2016. ^ "Binyamin Netanyahu is soft on anti-Semitism when it suits him". The Economist. Retrieved 30 September 2017. ^ "Hungarian PM: We share the same security concerns as Israel". Israel Hayom. Retrieved 30 September 2017. ^ a b Orbán, Viktor. "Prime Minister Viktor Orbán's speech at the 25th Bálványos Summer Free University and Student Camp". Government of Hungary. Retrieved 9 May 2016. ^ "Q&A: Hungary's controversial constitutional changes". BBC. 11 March 2013. Retrieved 9 May 2016. ^ Pack, Jason. "The Hungary model: Resurgent nationalism". The National Interest. Retrieved 9 May 2016. ^ "Playing with fear". The Economist. 12 December 2015. Retrieved 9 May 2016. ^ Schliefer, Yigal (October 2014). "Hungary at the turning point". Moment, Slate. Retrieved 9 May 2016. ^ Veer, Harmen van der; Meijers, Maurits (3 May 2017). "Analysis – Hungary's government is increasingly autocratic. What is the European Parliament doing about it?". The Washington Post. Retrieved 12 April 2018. ^ Zakaria, Fareed (31 July 2014). "The rise of Putinism". The Washington Post. Retrieved 9 May 2016. ^ Faris, Stephan (22 January 2015). "Power Hungary: How Viktor Orban became Europe's new strongman". Bloomberg. Retrieved 23 September 2013. ^ Woodard, Colin. "Europe's new dictator". Politico. Retrieved 9 May 2016. ^ Traynor, Ian. Refugee crisis: East and West split as leaders resent Germany for waiving rules, The Guardian, 5 September 2015. ^ "Migration crisis: Hungary PM says Europe in grip of madness". The Guardian. 3 September 2015. ^ "Hungary PM rejects Merkel's 'moral imperialism' in refugee crisis", Yahoo! News, 23 September 2015. ^ "‘People in Europe are full of fear’ over refugee influx", The Washington Post, 3 September 2015. ^ "Wauquiez is not "embarrassed" by Viktor Orban's speech on immigration". Le Journal du Dimanche. 12 July 2017. ^ Gorondi, Pablo (10 January 2019). "'Hungary's Orban wants anti-migration forces to control EU". Associated Press. ^ "Letter to the Prime Minister of Hungary from the Secretary of State of the United States of America" (PDF). 23 December 2011. Archived from the original (PDF) on 7 May 2016. Retrieved 5 May 2016. ^ "Angela Merkel criticized Viktor Orban behind closed doors", Daily News Hungary, 9 October 2015. ^ "The European Commission reiterates its serious concerns over the Fourth Amendment to the Constitution of Hungary". 12 April 2013. Retrieved 5 May 2016. ^ "Happy slaps, rambling speeches and jaw-dropping insults... this is the man who RUNS the EU", Daily Express, 28 June 2016. ^ "Press freedom a loser in Viktor Orbán's winner-take-all Hungary". 2 December 2011. Retrieved 5 May 2016. ^ a b "A village stadium is a symbol of power for Hungary's premier". The New York Times. 3 April 2014. Retrieved 1 May 2016. ^ "Orbán: van élet az EU-n kívül is". Új Szó. 1 February 2002. Archived from the original on 11 November 2014. Retrieved 19 March 2019. ^ "Orbán Viktor – Wikidézet". Wikiquote (in Hungarian). Retrieved 30 September 2017. ^ ""Orbán accuses Soros of stoking refugee wave to weaken Europe", Bloomberg, 30 October 2015. ^ Baker, Luke (10 July 2017) Israel backs Hungary, says financier Soros is a threat, Reuters, accessed 19 March 2019. ^ Gorondi, Pablo (3 April 2017). "Hungary: Parliament to rush bill targeting Soros school". Associated Press. Archived from the original on 2 April 2017. Retrieved 3 April 2017. ^ Witte, Griff (17 March 2018). "Once-fringe Soros conspiracy theory takes center stage in Hungarian election". The Washington Post. ^ "Hungary's Freudian political fight: Orbán vs Soros". Politico. 27 April 2017. ^ Walker, Shaun (22 June 2017). "'A useful punching bag': why Hungary's Viktor Orbán has turned on George Soros". The Guardian. ^ "Viktor Orbán's son-in-law awarded billions in state and local contracts". The Budapest Beacon. 22 December 2014. ^ "Orbán Gáspár játszott az NB I-ben". Blikk (in Hungarian). 8 March 2014. Retrieved 9 March 2014. ^ István, Sebestyén. "Orbán hite" [The faith of Orbán]. Hetek (in Hungarian). Retrieved 3 November 2013. ^ Goldblatt, David; Nolan, Daniel (11 January 2018). "Viktor Orbán's reckless football obsession". The Guardian. Retrieved 19 January 2018. ^ Orbán lenne a felcsúti focimese hőse, Origo; accessed 12 April 2018. (in Hungarian). ^ Puskas Academy, Vidi.hu; accessed 12 April 2018. (in Hungarian). ^ Foster, Peter (7 October 2016). "A village fit for a king: How Viktor Orban had a football stadium and a railway built on his doorstep". The Daily Telegraph. Retrieved 19 January 2018. ^ Buckley, Neil; Byrne, Andrew (20 December 2017). "Viktor Orban's oligarchs: a new elite emerges in Hungary". Financial Times. Retrieved 19 January 2018. ^ Sepp Blatter az Akadémián, Puskás Akadémia official website; accessed 17 June 2018. (in Hungarian). ^ Szegény Dzsoni és Árnika (1983), IMDb; accessed 17 June 2018. ^ Egy az ország – Orbán Viktor könyve Archived 26 November 2013 at the Wayback Machine Miniszterelnok.hu. Retrieved 17 January 2012. ^ Megjelent Orbán Viktor új könyve Fidesz. Retrieved 16 January 2012. ^ "Igor Janke: Hajrá, magyarok! – Az Orbán Viktor-sztori egy lengyel újságíró szemével – Az Orbán Viktor-sztori egy lengyel újságíró szemével". Bookline.hu. Bell, Imogen (2003). Central and South-Eastern Europe 2004. Routledge. ISBN 978-1-85743186-5. Martens, Wilfried (2009). Europe: I Struggle, I Overcome. Springer. ISBN 978-354089288-5. Lendvai, Paul (2017). Orbán: Hungary's Strongman. Oxford University Press. ISBN 978-019087486-5. Wikimedia Commons has media related to Viktor Orbán.